The GOP-controlled U.S. House of Representatives is set to vote on a resolution to overturn new rules issued by the National Labor Relations Board (NLRB) that streamline the union election process to make it fairer for workers, employers and unions. The GOP majority in the Senate already pushed through its version of the “joint resolution of disapproval,” a rarely used provision of the Congressional Review Act of 1996 that allows Congress to overturn certain actions by government agencies. Congress has only successfully used the provision once in 2001 when another GOP-controlled Congress killed the Clinton Administration’s workplace ergonomic standards that would have protected worker’s health. The NLRB issued the new election rules in December to streamline the election process and reduce unnecessary litigation companies often use to delay elections and undermine worker support for the union. The House version of the resolution, H.J. Res 29, would not only wipe out the new rules, but also prohibit the NLRB from adopting another rule in “substantially the same form” unless specifically authorized by Congress. For example, the Board could not issue rules requiring electronic filing of election petitions, which is faster than the current method of filing by mail. Electronic filing is consistent with practices in all federal courts. Once passed by Congress, the resolution needs approval by the president to take effect. President Obama’s senior advisors are recommending a veto. 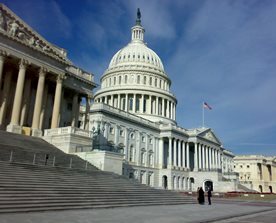 “Instead of seeking to undermine a streamlined democratic process for American workers to vote on whether or not they want to be represented, the Congress should join the president in strengthening protections for American workers and giving them more of a voice in the workplace and the economy,” the administration said in a statement about the resolution. Analysts say there aren’t enough votes in the Senate to get to the two-thirds majority (67) to override a veto. Read more about the GOP attack on the new NLRB rules.